As early as 1843, the cemetery in the church yard at St. Peter the Apostle parish began to fill with the remains of German Catholics who were then populating the neighborhood around 5th and Girard. In 1849, one and a half acres on Almond, Richmond, and Tioga Streets in the old “Northern Liberties” section just north of the former city limits was purchased for $126.00 for a parish cemetery to supplement the burgeoning church of St. Peter. The first burial occurred in August 1849. Those interred in the church yard were removed to this location in 1860 in order to make room for a new school building at St. Peter’s parish. In 1867, an additional three acres were purchased so that it encompassed an entire city block. It became known as St. Peter’s Cemetery. In 1869, a Purgatorian Society was founded at St. Peter’s Church in order to recall and bring consolation to deceased loved ones who are helpless to bring about their own redemption save for the graces sought for them by the living. Both living and deceased participants in the Society are remembered at daily Mass. 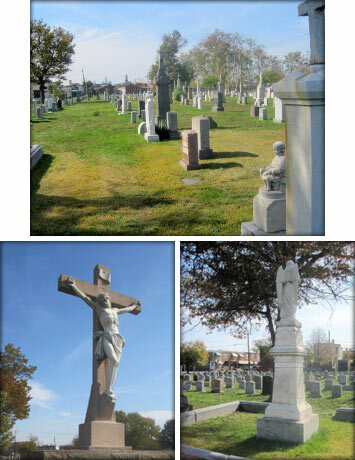 The population of St. Peter’s Cemetery continued to swell, so that in 1883 ten further acres were purchased in the Bridesburg section of Philadelphia. The acreage doubled in 1885 and the whole site was solemnly blessed by the Archdiocesan Vicar General, Monsignor Maurice Walsh, on October 23, 1887. In May of that year all of the Redemptorist confreres who had been buried in the vault of St. Peter’s Church from 1844 to that time were re-interred in the new cemetery. Other German Catholic parishes in the city also began to bury their dead at St. Peter’s, so that it was sometimes styled the German Catholic Cemetery. Though it remained in control of St. Peter’s Parish, the name was altered to Most Holy Redeemer.